elevation: 3,157 m. height gain: 1,440 m.
Beyond these signs is the decommissioned trail. Scramble: RT 14.0 (includes Haddo Peak); 7.0 up. 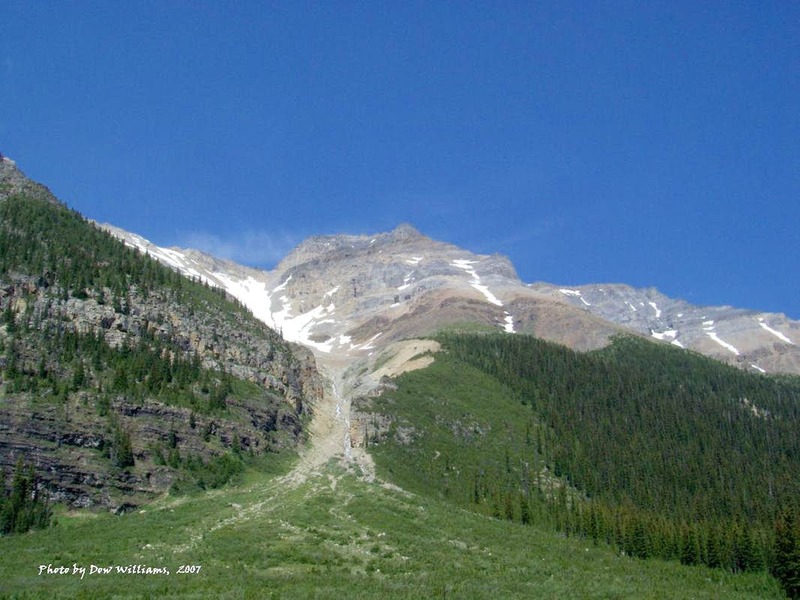 Aberdeen and Haddo are popular classic climbs in the Lake Louise area. The north-east glacier grants 3-4 pitches of 55˚ angle ice before reaching the upper mountain; paired with a relatively short approach and stunning views, it's no wonder many come here. Having little experience with ice climbing, we were quite thrilled to read about the straightforward climber's descent route via the south gully into Paradise Valley. There wasn't much information on the internet at the time other than Dow William's picture of the descent route; we'd envisioned going early summer to take advantage of some firm snow! After several fouled attempts, things finally lined up and we set off on this awesome trek with a fine bunch of people. Having read Matthew's recent trip report, we had a good idea of the conditions; unfortunately, Fab and I had to give up the idea of going with more snow... We met Charles, Jay, Derek and Sonny at the trailhead at 5 AM and soon got on the way. Conversation was plentiful as we hiked to the Lake Annette signs, we easily located the decommissioned trail and followed it. The trail is in good shape until you reach a crossing of Paradise Creek where the bridge is no longer, 534904. Staying on the east side of the creek, it's about 500 meters to the broad south gully. The initial section of bushwhacking is unpleasant but a little further, a faint trail exists along the creek; it's worthwhile aiming for it but it is much easier to find on the way down. Once in the open gully, we had a clear view of the uninterrupted scree slopes that lead to the west ridge. We started the ascent under cloud cover, overheating would not be a problem today. As we neared a narrow section of the gully, Jay noticed a grizzly bear above us, he was coming down on the trail. We scooted off to the side and bunched up. We warned Fab and Sonny below, they had searched for Sonny's lost GPS. I took pictures while holding my bear banger in the opposite hand. He appeared quite calm as he slowly meandered without looking at us much, almost no sniffing and no standing; it was a memorable experience. We continued on the trail to the water source and had a nice break on a huge rock in the basin. The following grind was lengthy, we welcomed the remaining snow and regrouped atop the snow slope. The last stretch to the summit ridge looked short but travelling was tedious at times, everybody was happy to gain the ridge and peer down at the Plain of the Six Glaciers. Following another break, we resumed hiking to the summit. Mount Hungabee was engulfed in dark cloud, it seemed to hold back the poor weather; east of us, blue sky and fair weather clouds were observed. Jay managed to check the weather forecast on his phone and we collectively decided to carry on to Haddo Peak but only after a spontaneous riff of Bohemian Rhapsody. We stayed on Aberdeen a short time, we knew we'd be back! Soon thereafter, we came across the access for Sheol Mountain. Along the way, we spotted the Mothership. Beginning a short bushwhack towards Aberdeen's south gully. Hiking through this shrubbery was the worst bit; going wide climber's left of the fan offers much better travelling. Nearing the narrow section of the gully. A collared grizzly walks right past us, about 40 feet away with very little fuss. We continued on the trail the bear just used. This stream is a good source of water, it comes straight out of the ground. Taking a snack break in the basin. Not as much snow as we would have wished but very welcomed none the less. Trekking on snow as far as we can. Loose and steep, we stayed on bigger rocks whenever possible. Jay enjoys the scenery from an outcrop on the west ridge, Mounts Lefroy and Victoria in the background. Another nice break with fine views. Last stretch to the summit of Mount Aberdeen. Pointy Deltaform Mountain and Mount Hungabee on the right, Horseshoe Lake is partially obstructed. Last steps with a dramatic backdrop. A quick pause on Aberdeen before we continue to Haddo Peak. Haddo Peak is a straightforward objective over simple glaciated terrain. Heading down the connecting ridge.